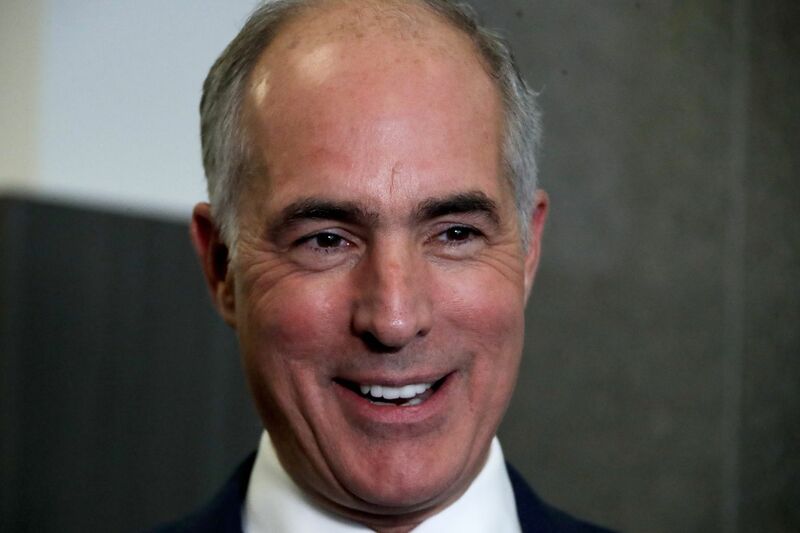 U.S. Sen.Bob Casey, D-PA, in interviewed by reporters following his second debate with Republican challenger U.S. Rep. Lou Barletta, Friday Oct. 26, 2018, in the studio of KDKA-TV in Pittsburgh. It could have been a Pennsylvania rematch, by proxy, of the 2016 presidential election. But U.S. Rep. Lou Barletta, President Trump's hand-picked candidate to challenge U.S. Sen. Bob Casey Jr., never came close to matching his political patron's star-power and lacked the resources needed to effectively introduce himself to voters across the state. Casey, a Democrat from Scranton who inherited a well-known political brand, was leading Barletta 55 percent to 43 percent with 79 percent of the vote tallied Tuesday night. Casey, in his victory speech, called his election "a victory for people across our commonwealth who want a new direction in Washington." Barletta, in conceding the race, predicted Casey will represent Pennsylvania well. "I hope he'll be able to work with President Trump for the good of the American people," said Barletta, who was recruited by Trump to challenge Casey. "I'm sure he will." Barletta, 62, the former mayor of Hazleton, tried to cast Casey in the election as a onetime moderate who has shifted leftward during his time in the Senate, putting him out of touch back home in Pennsylvania. Casey, 58, looked past Barletta for much of the race, presenting himself as a senator willing to work with Trump on issues like infrastructure, middle-class wages and healthcare policy. But he also said he would challenge a president enthralled to special interests. The race was more fizzle than sizzle, despite Trump's efforts to boost Barletta with fundraisers and rallies in Wilkes-Barre in August and in Erie in October. Trump also sent Vice President Mike Pence to help Barletta raise money in Philadelphia in July. Casey, the namesake son of a former governor, has held elective statewide office since 1997, serving as Pennsylvania's auditor general and then treasurer before winning his Senate seat in 2006. Barletta forged his political brand with illegal immigration, including a 2006 controversial push in Hazleton for an ordinance to punish businesses and landlords for hiring or renting to undocumented immigrants. That law, which was never enforced, prompted a federal lawsuit that cost the city nearly $1.7 million. Barletta insisted his town of 25,000, where the Latino population soared from 5 percent in 2000 to 52 percent in 2016, had to act because of rising crime and costs. Barletta always lagged Casey in fundraising, making it difficult to tell his story. "I think more T.V. commercials, more media would have helped," said Val DiGiorgio, chairman of the Pennsylvania Republican Party Tuesday. The sharpest exchange in the Senate race was sparked by the Patient Protection and Affordable Care Act, also known as Obamacare, the 2010 law that helped propel Barletta to win a seat in the House amid "Tea Party" Republican opposition to then-President Obama's signature legislation. Barletta lashed out at Casey in mid-October for a campaign commercial suggesting the Republican supported removing health insurance protections for patients with preexisting medical conditions. That aired while Barletta's 18-month-old grandson was being treated for cancer. Casey pulled the ad in the television market that broadcasts in Hazleton but defended it, pointing to Barletta's votes to repeal Obamacare and to support legislation that would have allowed insurance companies to charge some customers higher rates for preexisting conditions. Barletta tried to parlay a Trump insult of Casey — casting him as "Sleepin' Bob" — to suggest the senator was ineffective. But the primary metric Barletta used to make that claim, serving as primary sponsor for legislation signed into law, showed the two politicians have similar records in the U.S. Congress when party control of the Senate and House are considered. Casey and the Democrats had control of the Senate for the first two years of his first six-year term but has been in the minority since 2011. Barletta, who did not seek a fifth term this year, has spent all of his time in the House in the majority.